Shane Murphy works on the robot for the VEX U Robotics competition. Shane Murphy, from Long Island, N.Y., is a second-year electrical engineering major. Murphy is a member and team leader of RIT’s VEX U Robotics Team. VEX U is the college division of a program created by VEX Robotics that gives students a task and allows them to build robots to execute the task. After building their robot, students from all the different participating schools are able to travel and compete in a one-day competition to see who has created the most efficient robot. Murphy has more than three years of experience from high school working on robots for a similar program created by VEX Robotics: The VEX Robotics Competition. 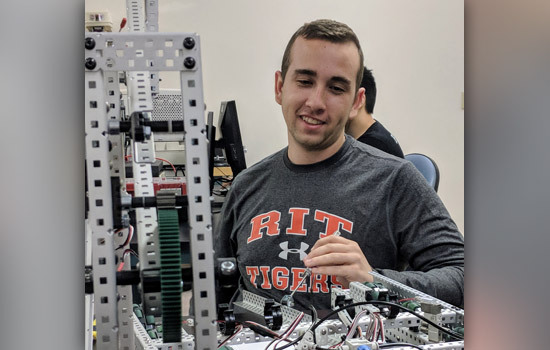 When he discovered the opportunity to get involved with VEX again at RIT, Murphy jumped at the chance to join the team. For Murphy, automation and robotics isn’t just something he learns in class. It’s a hobby that he loves, and one that he hopes to turn into a career. Answer: There were a couple of other colleges I wanted to go to, but they didn’t have a dedicated engineering program like RIT did. That and the opportunity for co-ops really helped sway my decision toward RIT. The idea of being able to graduate and pretty much be ready to get a job or actually being in a job while going to school sounded great. Co-ops can make the difference between getting a job right after graduation and having to wait two or three years before you get your foot in the door. Q: What about robotics and the VEX U team is interesting to you? A: I really like automation. I’m all about efficiency, making things more efficient and more productive. It really interests me, and I like doing that type of stuff. Our team is competition based, so there is the fun aspect of competing with other teams. It’s not just ‘build this robot that can do these things.’ We are building for a purpose. We also get to meet teams from other schools who are interested in the same things we are. We are all doing the same thing and one might be better than the other at the end of the competition but it’s still all fun. Q: How did you become the team leader of the RIT VEX U team? A: We didn’t really have an organized team last year, which was my first year at RIT. I don’t know how I found them, but when I met some of the people involved with the robotics team I saw that none of them really had experience with VEX before. I was coming in with three-plus years of experience, so I kind of knew all the aspects of designing for this specific program. Because of that it just made sense for me to take on the leadership role so I could help guide and teach everyone else what was expected and how to do everything to the standards of VEX University. Q: What do students involved in the team do for these competitions? A: We get a task at the end of the previous season, and we have to build our robots to complete the tasks given to us. For VEX U, it’s a one-on-one competition, so there are two robots on the field at a time and each is trying to get more points than the other to win. Designing the robot is a big task that has to be solved by everyone involved in the club. We need to design how to move the robot, how to move the game pieces and how to incorporate sensors into the robot so we can do everything autonomously. Then you have to actually build it. This can be hard because once you build something once, if it doesn’t work you have to step back, fix it and build a new robot that does work. Then there is programming. In the competition, there is one minute of autonomous operations, which means no one is physically operating or controlling the robot, and 45 seconds of controller operation. The autonomous portion is really important, it’s the majority of the game, and that’s what we design and use the sensors for. So, programming is also a huge part of making the robot. Then you also have a driver, who is tasked with operating the robot during that 45-second portion of the competition. There are a lot of different jobs we need to collaborate on so our robot can run successfully. We don’t really have a name for the robot we are working on now, it’s just a robot that is designed to pick up cones on a field and stack them. The more cones you pick up the more points you get in the competition. I think we will do well in the competition this year. Q: What do you think is the biggest challenge when creating a robot? A: Getting something that works. You’ll never get it right on the first try. You’ll try to do something and find out that it doesn’t work, so then you have to go back and figure out how to fix it and make it work. You make those changes and hope it works the next time, but you might have to go back three or four different times to make it work correctly. Sometimes you’ll put the whole thing together and say it works but it’s not the best so you have to build a new robot that is more efficient and start again. Q: What is one of your fondest memories of being involved with the VEX programs? A: Since this is kind of a new team at RIT, I don’t have too many memories here yet, but in high school, my team went to a world championship three times in a row. The first one was in California and the other two were in Kentucky. It was really fun because you go and meet literally thousands of people who are all interested in the same thing as you. The ages range from middle school to high school and even college students. I got close to some of the students from colleges in my region through these competitions. Talking to them was great because they were all professionals to me, they knew what they were doing. It was just so interesting talking to people to see what they’re doing, how they’re doing it and seeing what they’re interested in. A: I probably want to move to either Florida or California, maybe even Texas. I want to get into the space industry. I want to help SpaceX with their mission of inter-planetary travel. I’ve always been interested in it. I love space. I hope to apply everything that I’ve learned from VEX U and incorporate it into my future work because that is basically what I would like to do; build robots. Working in the space industry and designing robots that travel to different worlds would essentially use the same concepts I’m using now, just on a much larger and more expensive scale.